Check out Michael Wittig's quick tutorial for managing AWS EC2 SSH access with IAM. You can only use one key per EC2 instance. But, you shouldn't share keys between users. Access to EC2 instances via SSH can not be restricted to specific users. Therefore, many of our AWS consultancy clients ask me, How can SSH access be managed without too much overhead? How can only certain people access certain machines over SSH? How can I maintain a separate SSH user per employee to trace who did what? How can SSH access be revoked in case someone leaves the company? How can SSH public keys be rotated? Wouldn't it be nice if you could use IAM for that? Yes, you can! Using IAM to store and retrieve public SSH keys. You may know about that if you use the CodeCommit service. Making use of sshd's AuthorizedKeysCommand to retrieve the public key from IAM. To see my solution in action, run the following showcase. Skip the section if you are only interested in the theory. The showcase demonstrates how you can use your IAM user's public SSH key to get access via SSH to an EC2 instance. Open the Users section in the IAM Management Console and click the row with your user as demonstrated below. Click the "Upload SSH public key" button at the bottom of the page as demonstrated below. Paste your public SSH key into the text area and click the "Upload SSH public key" button to save. Wait until the stack reaches the state CREATE_COMPLETE. Copy the PublicName from the stack's outputs. Connect via ssh ssh $Username@$PublicName replace $Username with your IAM user and $PublicName with the stack's output. 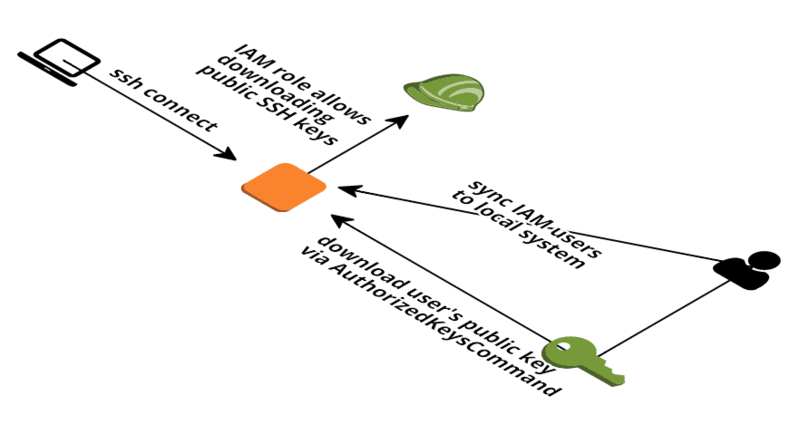 Managing SSH access on AWS can be achieved by combining IAM and sshd's AuthorizedKeysCommand. By restricting the iam:GetSSHPublicKey action to certain users you can restrict which users can access what EC2 instances. You can find the source code on GitHub. IAM public SSH keys are intended to be used with CodeCommit. My solution can be labeled a "hack." Anything missing? Looking forward to your feedback! @hellomichibye or michael@widdix.de.